The re-release of Ant's back catalogue by Esoteric Recordings continues with a deluxe 3 disc edition of the classic instrumental album 1984. Esoteric Recordings are proud to announce the release of a newly re-mixed and expanded edition of the classic instrumental album 1984. Released in 1981, the album was born at the same time as Anthony was composing and recording the soundtrack to the British TV documentary series Rule Britannia. 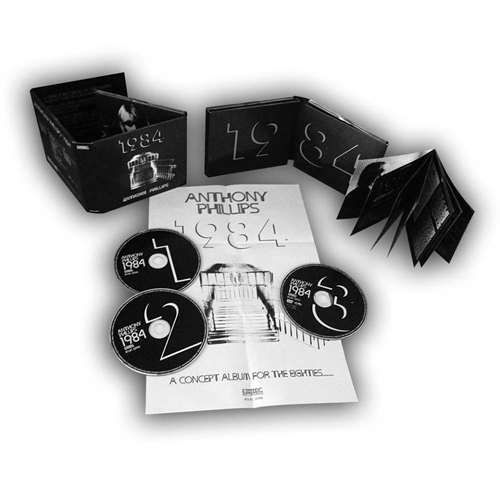 1984 was a radical departure from the more pastoral feel of Anthony's previous solo work, and saw him experiment with synthesisers to an extent he'd previously never done before, resulting in a keyboard dominated album. At the time of release, the album divided opinions among some Anthony Phillips fans, but the passage of time has seen the album re-evaluated and it is now held in high esteem by fans, critics and musicians (including Steven Wilson), all of whom concur that 1984 now stands as a ground-breaking and influential work. This new 3 disc digipack deluxe edition of the album features a new stereo mix and a 5.1 Surround sound mix, (on an NSTC / Region Free DVD), along with a CD of alternate mixes and out-takes. It includes a lavishly illustrated booklet that fully restores the original album artwork and features a new essay by Jon Dann (with a brief foreword text by Steven Wilson) and also includes a poster. The deluxe edition of 1984 is released on 24th June 2016 and is available to order now from Cherry Red and Amazon.